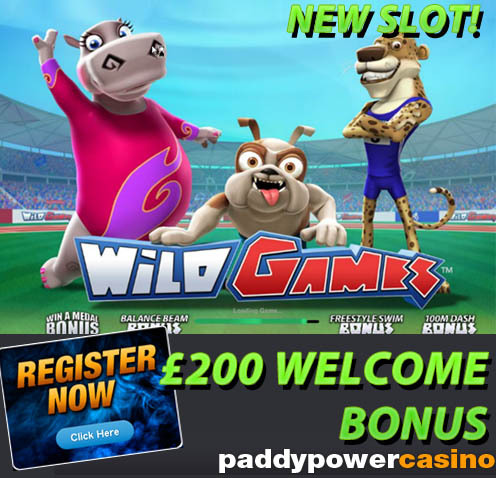 Playtech powered slot Wild Games is new to play at Paddy Power Casino. Wild Games is a fantastic 5 reel video slot featuring the the animal kingdom’s answer to the Olympics and 4 bonus features. This slot is packed with features - get 3 or more bonus symbols of the same colour (Gold, Silver, or Bronze)anywhere on the reels, you will trigger the Win A Medal Bonus round. Pick 1 of the medals to give you a cash prize - with the gold medals, you can get from 4 times to 100 times your stake! With Stacked Wilds, Freestyle Swim Bonus feature, 100m Dash Bonus feature, Balance Beam Bonus feature and a 3,000 coin jackpot Wild Game is well worth a spin. Wild Games can be played at Paddy Power with £5 free for all new players (no deposit required) and there's up to £200 free in match deposit bonuses too. We recommend Paddy Power for UK players.